Statutory forms and explanatory notes for issuing notice that the landlord opposes granting a new business lease. 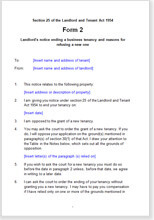 This is a pack of the forms you will need if you are a landlord opposing the renewal of a commercial property lease. It contains all forms for all the possibilities – although only one or two may be required in your circumstances. All comply with the LTA 1954 (Part 2) and the Regulatory Reform (Business Tenancies) (England and Wales) Order 2003. A landlord who opposes a lease renewal must serve the correct notice between 6 and 12 months before the present tenancy should end (which will be after the expiry date of the existing lease). For more information, read our guide on serving s25 notices. This type of notice cannot be served on the tenant if he or she has pre-empted this action by serving a Section 26 notice first. If you do not oppose the grant of a new lease, an alternative form should be used. This document has been drawn by Rajeev Goswami, unconnected with Net Lawman. Rajeev Goswami will welcome your contact for further legal help. There may be a charge for Rajeev Goswami services. "We use Net Lawman because it is an excellent website and always has the document you are looking for."